Coming home with nice pictures changes the whole complexion of my hikes. Case in point: I hiked just over 11 miles Sunday on the trails of Piedmont Environmental Center, about 30 miles east of my doorstep. 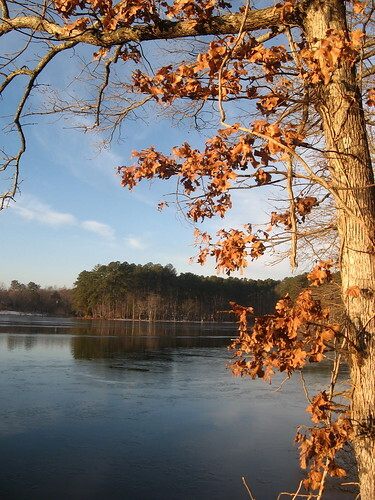 The hiking’s just bumpy enough to remind your lower extremities that you’re not on a treadmill; the best trails track the shores of High Point City Lake, a reservoir for the city’s water supply. On paper it’s unimpressive, but on the right day — at the right time of day — you can get an impressive hike in. Piedmont Environmental Center is close enough to home that I can arrive before sunrise without losing half a night’s sleep. Some part of my brain has known this since I first learned about the place over a year ago, but Sunday morning I finally got around to acting on it. Weather and timing dovetailed (I think I even saw some doves!) and I hit the trail with wonderful “golden hour” light. Even after the morning glow faded, it just felt like a good place to be hiking. 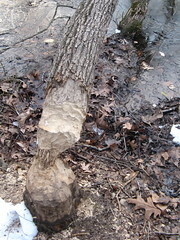 I didn’t see much wildlife — trees gnawed by beavers (left) notwithstanding — though I did scare off a small flock of ducks and one large wading bird (probably an egret; it was going too far, too fast to be certain). So about the hike: I started out at the Environmental Center HQ, which isn’t open on Sundays. 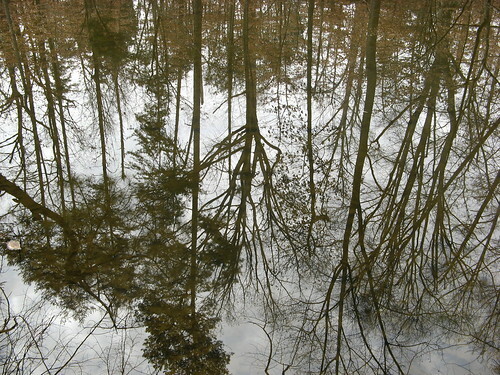 The center’s main jobs are preserving a small patch of suburban woodland and showing people why it’s worth preserving. 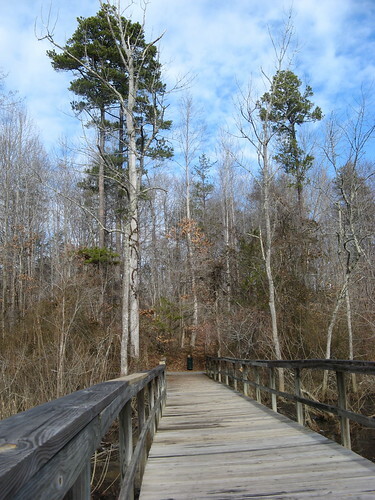 A side benefit is at least 10 miles of nature trails, which are generally well designed and nicely maintained. The primary wrinkle is that while the trails are all named, the trail markings don’t use trail names. Instead they use blazes, which work as expected if you happen to have memorized the big sign board at the trailhead. The secondary wrinkle is that the trails are divided into northern and southern sections, connected by the Bicentennial Greenway, which is all paved. For my money the best option is to start at the HQ (southern section), hike the trails near the lake first, then take the greenway to the northern section. This maximizes your time on hiker-only single-track and minimizes pavement pounding. Who’d have thought old dying leaves could look so good? 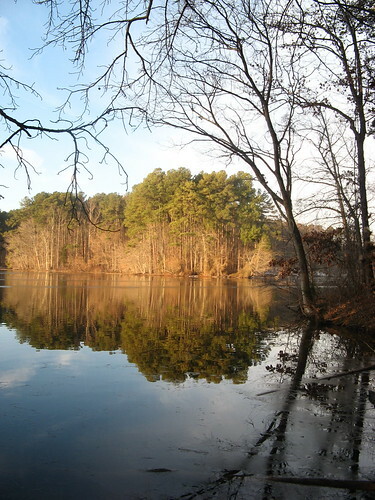 The go-to track from the HQ is the Bill Faver Lakeshore Trail, which hugs the shoreline on a spit of land jutting out into High Point City Lake. A nice little loop from that trail is the Raccoon Run, where I snapped this one just as the sun was peeking over the trees on the distant shore. OK, so I got a little carried away with the reflection shots. Here’s another from Raccoon Run. Great thing about going here in winter: you can bushwhack down to the shoreline without fear of getting eaten up by bugs or bitten by venomous snakes. And you can see scenes the forest obscures the rest of the year. So after the Bill Faver trail, I headed north on the Bicentennial Greenway — which has remarkably varied grades for a path of this kind. Lots of hills, steps and climbs to keep your heart happy. The Greenway crosses a road and comes to a sign board where it’s a right turn for another excellent trail near the shoreline. 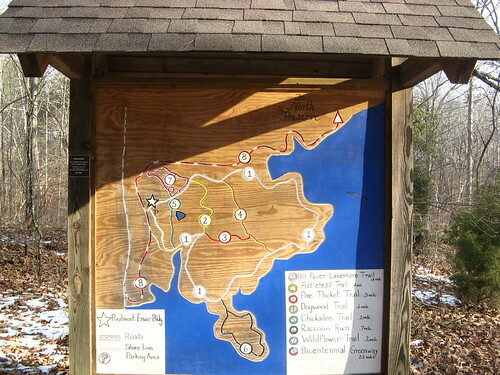 The Deep River Trail is over 4 miles of predominantly single-track hiking. Frankly it’s a great trail for a suburban park. 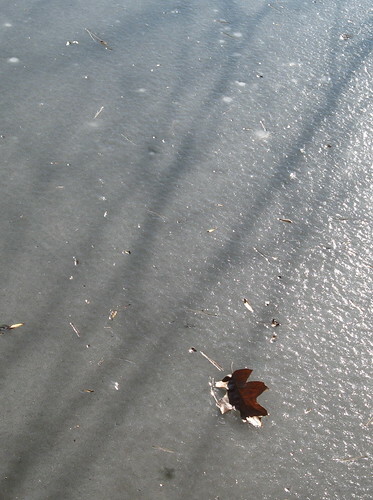 Leaf on the ice along the Deep River Trail. Yeah, there was quite a bit of snow. Not deep, of course, this is Dixie after all. 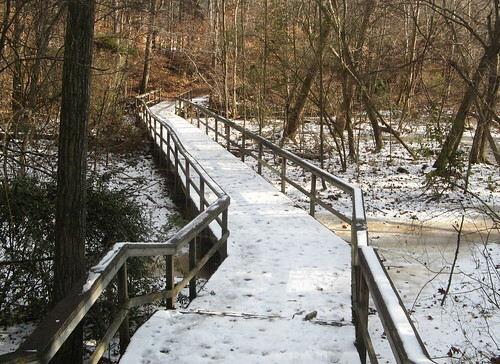 Eventually the trail intersects again with the greenway, which passes this observation deck looking out into a swamp. Great place for birdwatching in the morning and evening. I got there too late to see any. 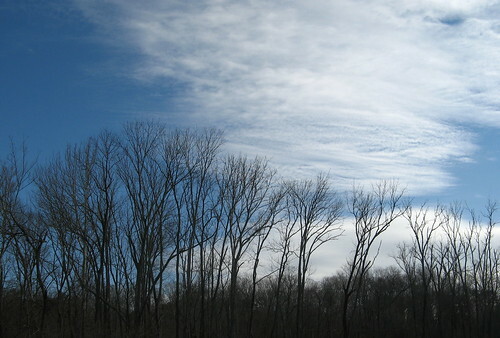 Trees and sky near the observation deck. So, have I gotten the reflection shots out of my system? Don’t count on it, this is one kind of scene my cheap digicam can capture, if the light’s right and my luck holds. 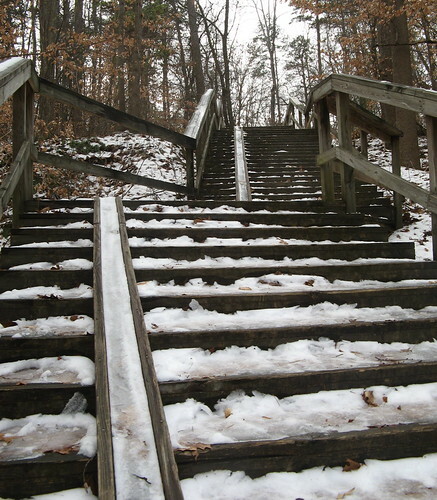 I’ll close with this shot of the channels for bicyclists built into the stairs on the greenway. These were installed to help people walk their bikes up and down the stairway, but I can’t help wondering how many daredevils cave to temptation and ride them downward to disaster. Reckon that’ll do it for this week. No post next weekend — I’ll be too busy sleeping off my week in Salt Lake City at the annual Outdoor Retailer Winter Market. Check my friendly place of employment for updates starting Wednesday evening. 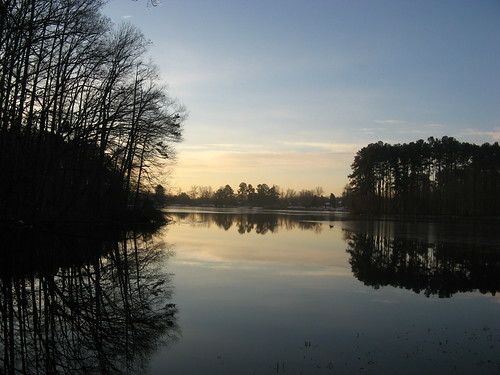 Piedmont Environmental Center home page. Enjoyed the trip report. 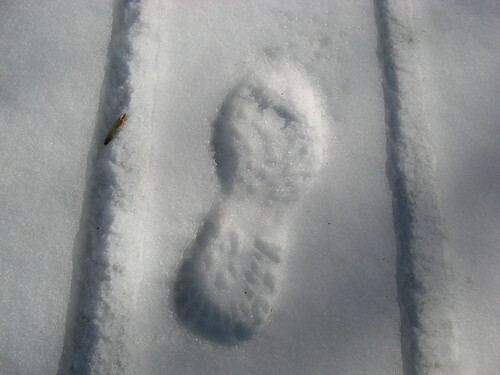 Looks like you had a nice, relaxing hike — nothing strenuous like the Grandfather Mountain ones. Never seen the bike channels on stairs in any of our hiking areas around here. I imagine its even more dangerous when they are frozen over like in your pic.